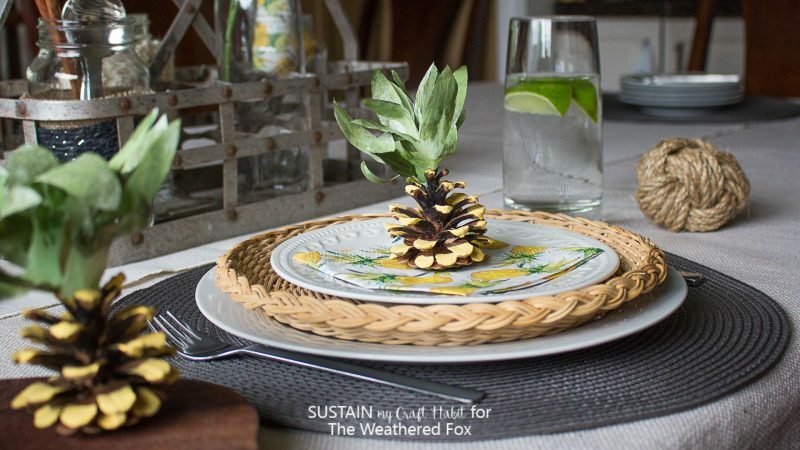 Today is day three of our Pineapple Week on The Weathered Fox, and we’re sharing another idea for how to use pineapples in your tablescape! 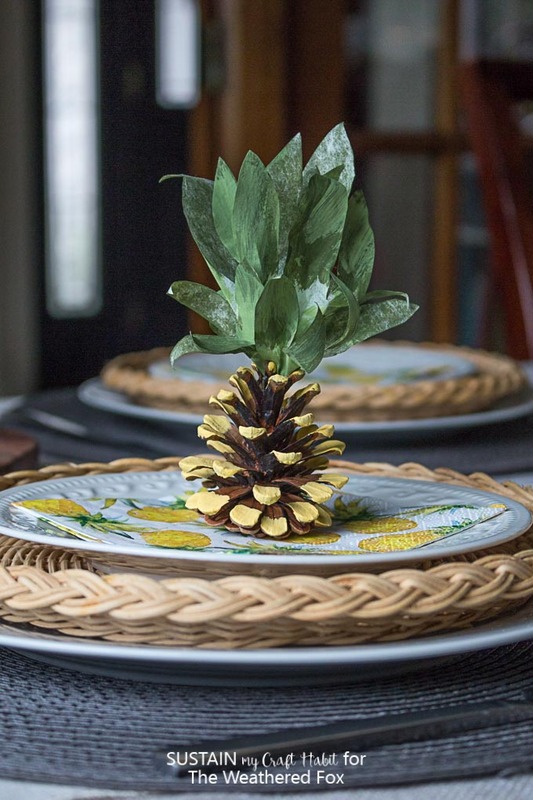 This simple pineapple pinecone idea from Jane and Sonja is one of those ‘why didn’t I think of that’ projects! 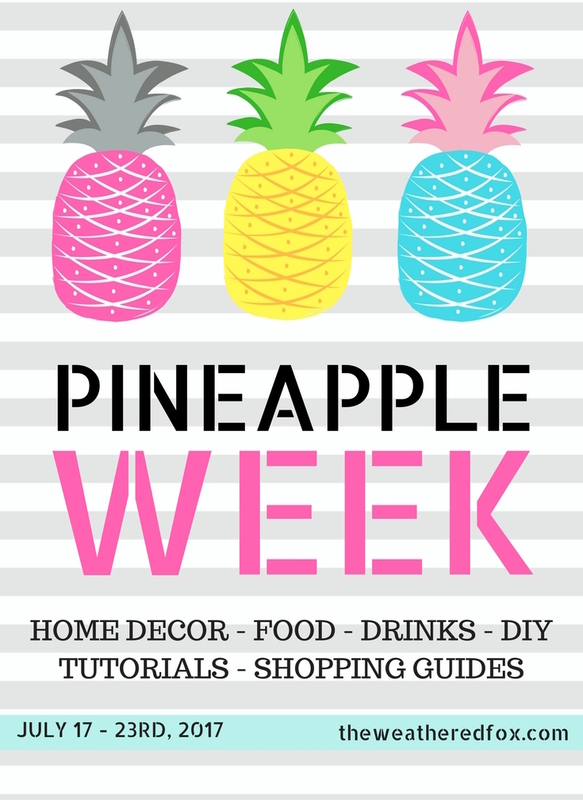 Make sure to check out all of our pineapple posts throughout the week! Are you as nuts about pineapples as we are? 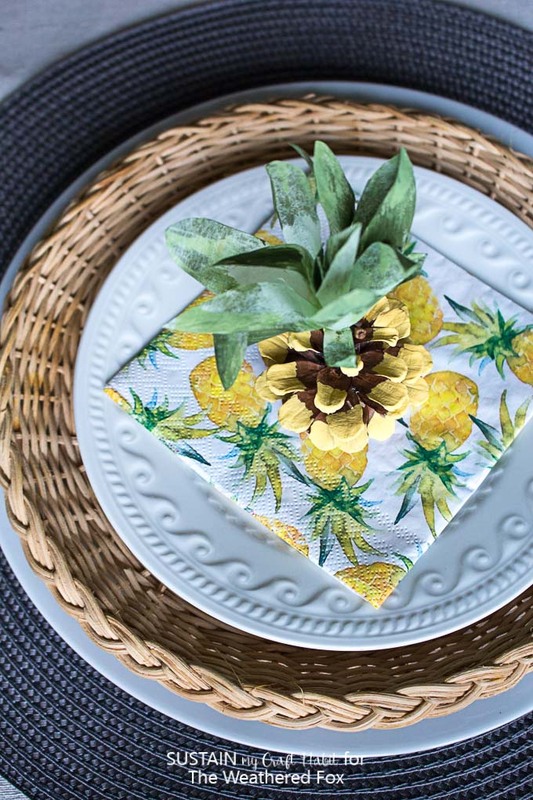 If so, include these fun DIY pineapple party decorations at your next get together with your friends and family! 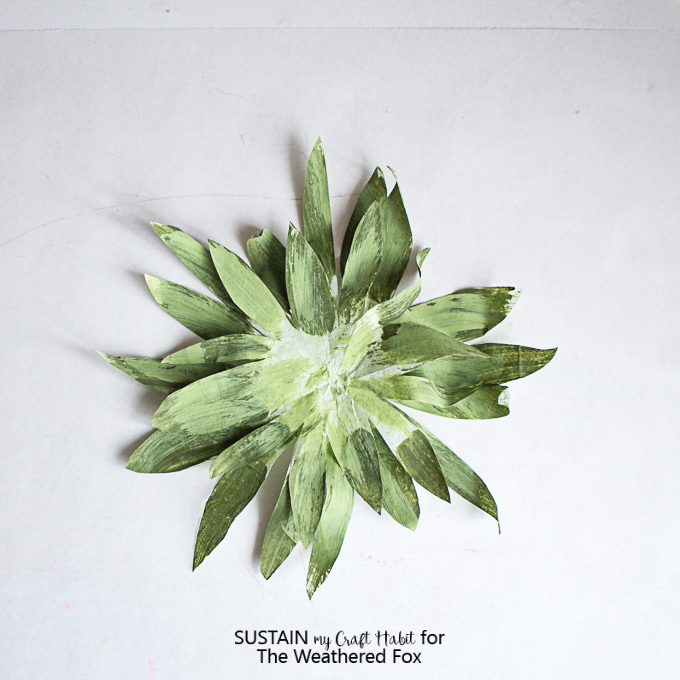 Sonja and Jane here from Sustain My Craft Habit a DIY, craft and home decor blog where we share creative nature-inspired projects. 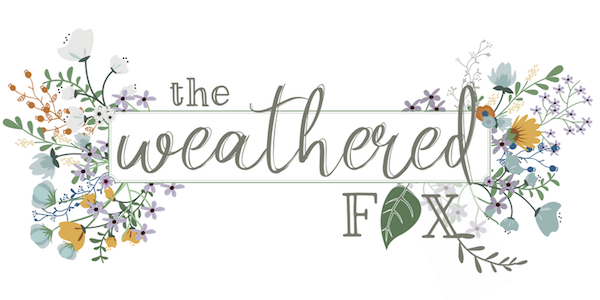 Thank you so much to Crystal for inviting us to share some DIY ideas here on the Weathered Fox. 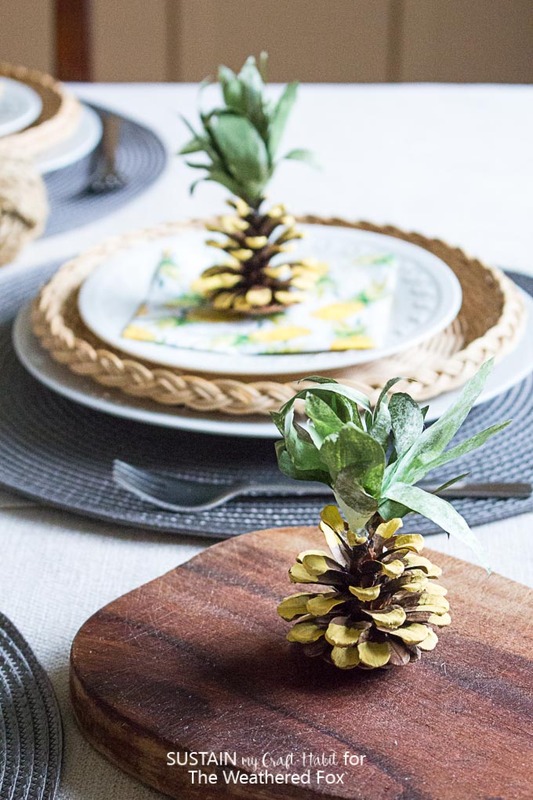 We wanted to combine two of our loves: pine cones and pineapples by making these pineapple party favors that could be used for any rustic outdoor wedding decor, pineapple themed party or simply as fun pineapple party decorations at a casual get together. 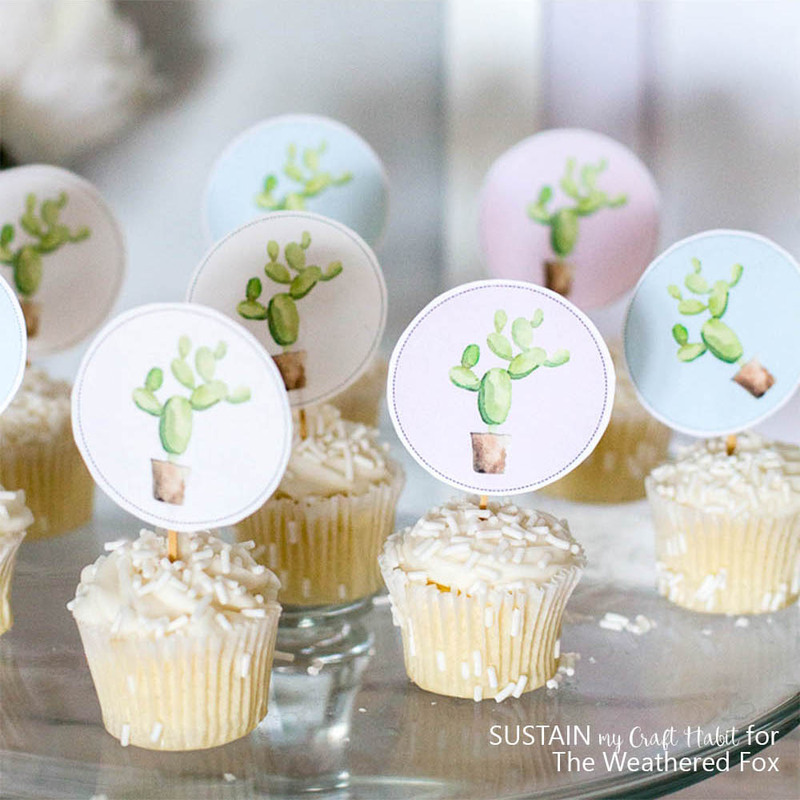 Pineapples are not only super sweet and delicious but also look absolutely adorable as party decor and accessories. 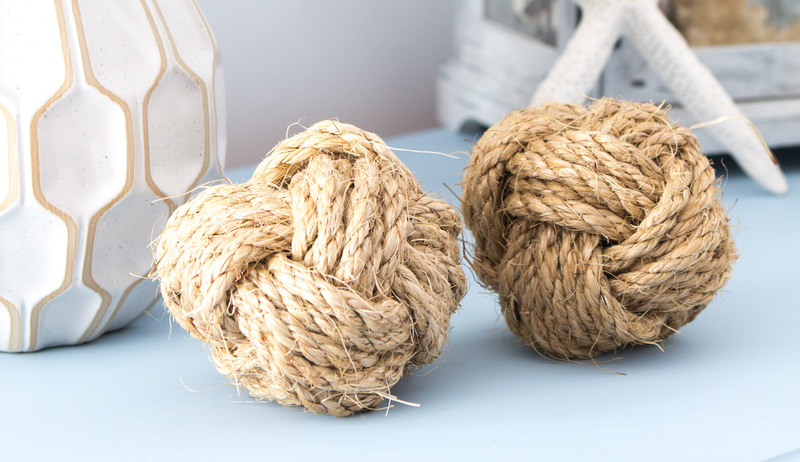 We’ve styled ours as napkin weights! Acrylic or Chalk Paint (we used Decoart Americana Chalky Finish in Rejuvenate (yellow), Decoart Americana Chalky Finish in New Life and Decoart Americana Chalky Finish in Enchanted (leafy green colors)) but you could also use Decoart Americana Multi-Surface Satin paint which comes in a wide range of colors. 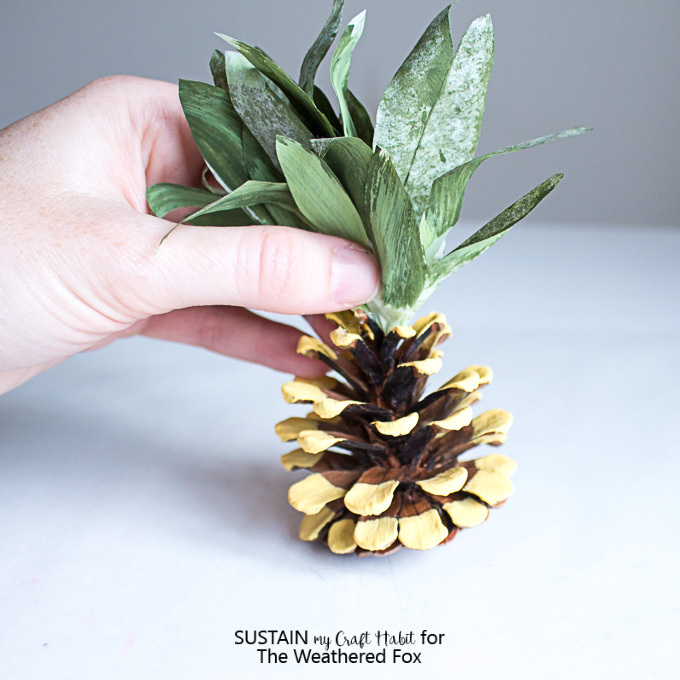 Thoroughly clean your pine cones before proceeding with this project. 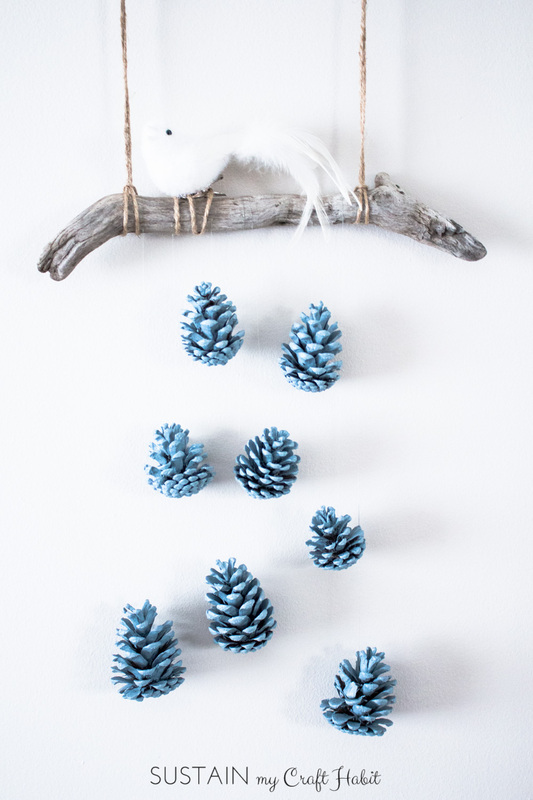 For tips on how to clean your pine cones, check out this post. 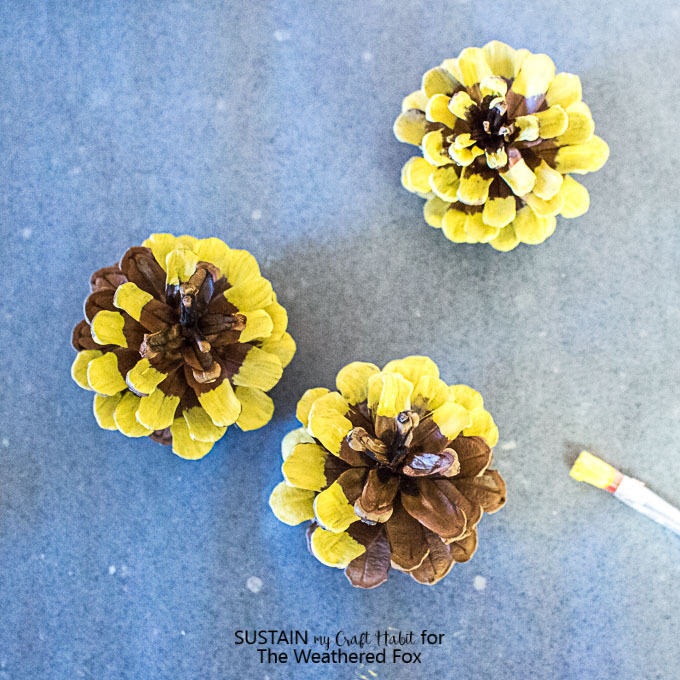 Using a small paintbrush, apply yellow paint to tips of pine cone. Put aside to dry fully before moving on to next step. 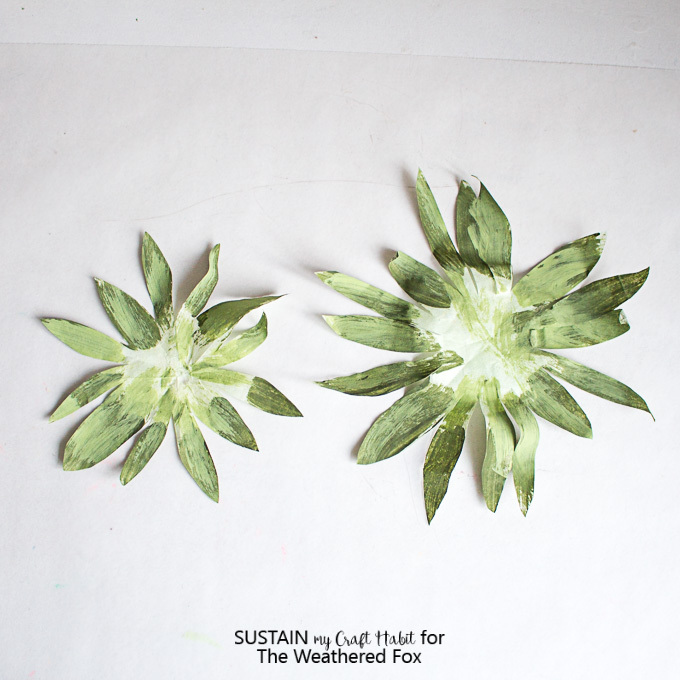 Dye the coffee filters green by placing them in a medium sized bowl filled with 2 cups water, 1 tablespoon white vinegar and 4 drops of green food coloring. Let filters soak for 15 minutes. Remove coffee filters and place on a wire rack to dry before moving on to next step. 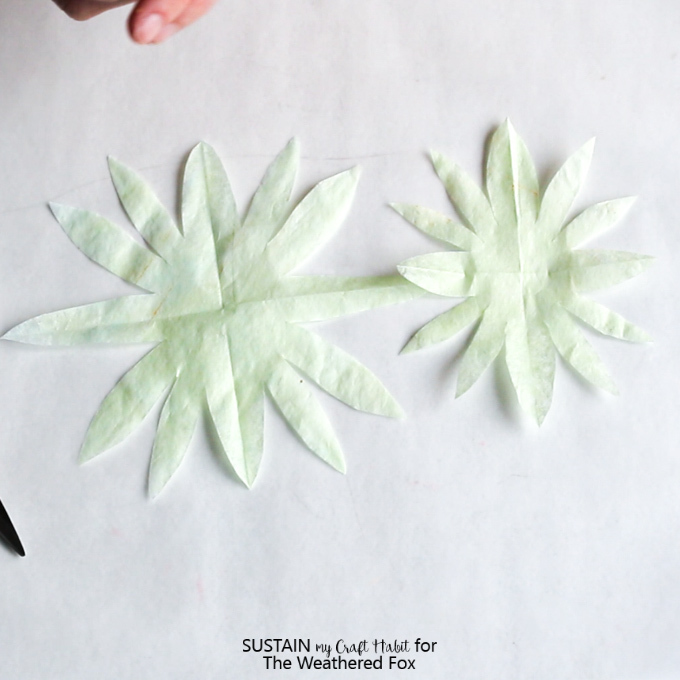 Once coffee filters are dry, cut out the pineapple leaves as shown. 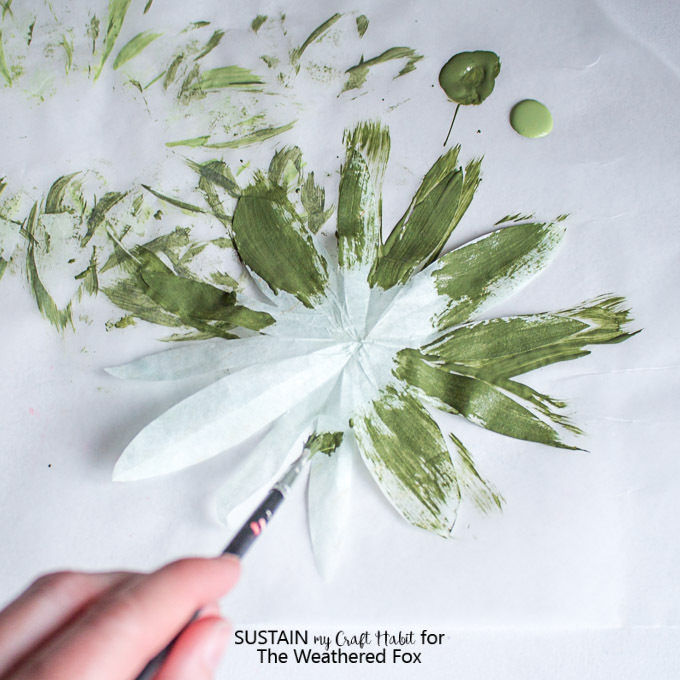 Using a small paintbrush, lightly paint the cut out coffee filter with two shades of leafy green colors. Put aside to dry fully. Once the painted cut out coffee filters are dry, apply a small dab of clear hot glue to center of large cutout. Stick the smaller cutout over top to join together. 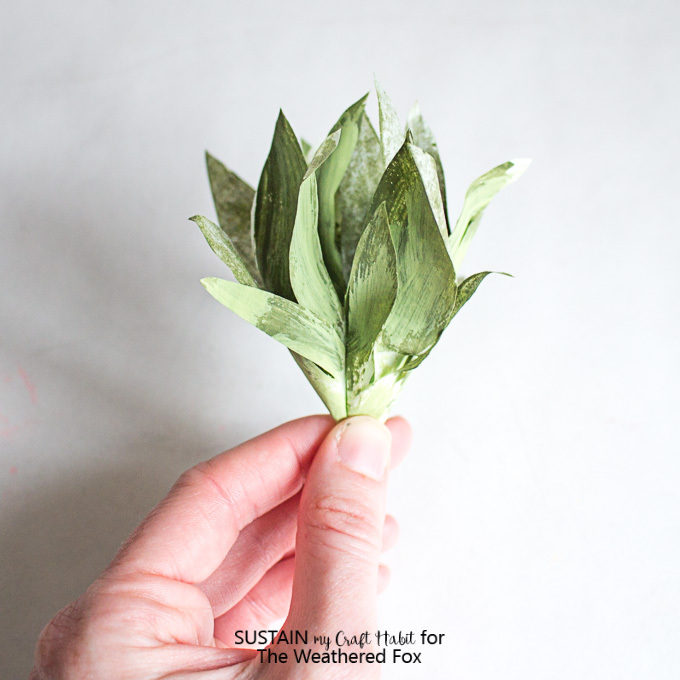 Fold leafy ends together creating a point at the base. You can use a skewer (but avoid pushing too hard or it will tear the filters) to help with this step. 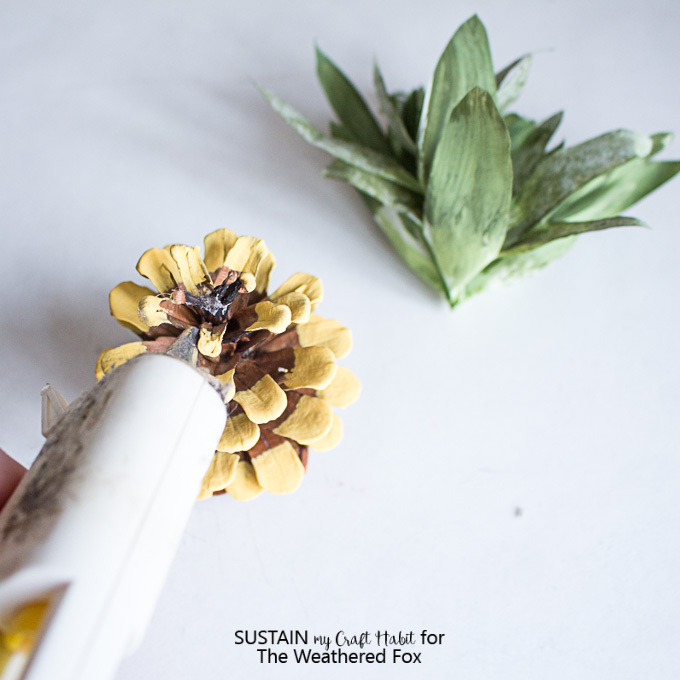 Apply a small dab of hot glue to top of pine cone and stick leafy green to top. Hold in place until secure. 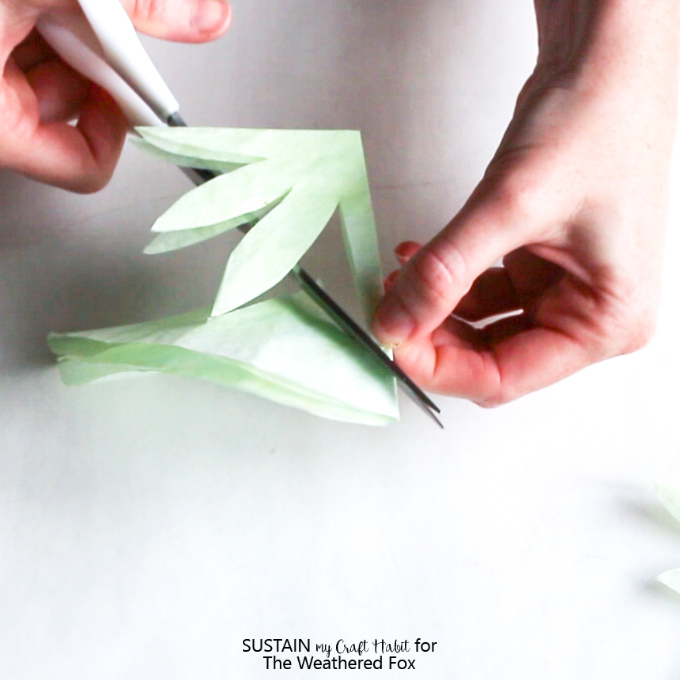 Smooth out the leafy cutout using the blade of scissors. 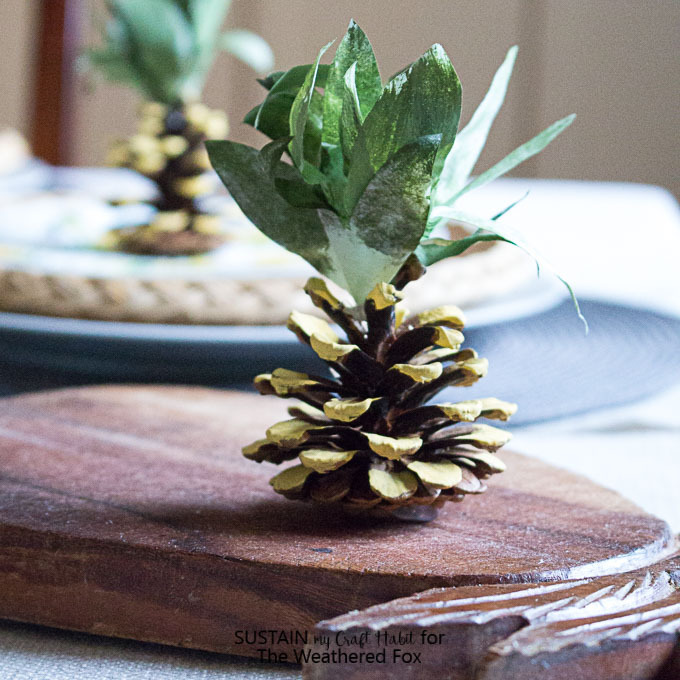 Tip: if your pine cone is a little tipsy, simply add a dab of hot glue to bottom of pine cone to help level the pineapple. Enjoy your pineapple party decorations! These are so neat, what a great idea! Thank you Jessica! They were fun to make :).